Tokyo, August 24, 2005 — Mitsubishi Motors Corporation announced that it would enter a Lancer Evolution MIEV1 test vehicle in the Shikoku EV Rally 2005 to be held August 27-28 in Tokushima Prefecture on the island of Shikoku, Japan. Deriving from the Company's Lancer Evolution IX high-performance 4WD sports sedan, Lancer Evolution MIEV uses a lithium-ion battery system to power four newly developed in-wheel motors. The Shikoku EV Rally 2005 is organized by the Shikoku EV Challenge Committee and the Shikoku EV Rally 2005 Executive Committee. Mitsubishi Motors is driving forward the development of the Mitsubishi In-wheel motor Electric Vehicle (MIEV) next-generation electric vehicle and is planning to bring a MIEV model, built around core technologies of in-wheel motors and high density lithium-ion batteries, to market by 2010. 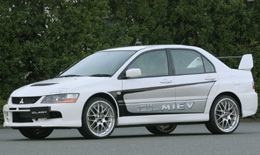 The Lancer Evolution MIEV will be the Company's second MIEV test vehicle, following the Colt EV announced in May 2005. The new in-wheel motor uses a hollow doughnut construction that locates the rotor outside the stator as opposed to a common electric motor where the rotor turns inside the stator. This construction brings several benefits. It makes it easier to raise power output and torque; higher torque allows the speed reducer unit to be eliminated, which means less weight and improved power transmission efficiency; and it offers better space efficiency with the brake assembly fitting inside the motor which itself fits neatly within the wheel house. The outer-rotor arrangement also surmounts the difficulties presented to date by the steering system, making it suitable for fitting to and driving the front wheels that opened the way to 4WD in-wheel motor vehicles. Mitsubishi Motors has acquired vehicle type certification for Lancer Evolution MIEV and will be conducting practicality evaluations over a wide variety of conditions, the Shikoku EV Rally and other public road driving included. The evaluation programs will assist the Company in developing high-performance electric, hybrid and fuel cell vehicles that deliver not only superior environmental performance but also output performance and maneuverability equal to or better than gasoline-fueled vehicles. Mitsubishi Motors' MIEV concept comprises two core technologies: lithium-ion batteries, which the Company has been developing for practical application in automobiles; and the in-wheel motor that, as its name implies, mounts inside the vehicle wheels. Building upon the advantages offered by these technologies, the MIEV concept is currently the main driving force behind the Company's development of next-generation electric vehicles. Mitsubishi Motors also envisages the application of the MIEV concept in hybrid and fuel cell vehicles. The first MIEV test vehicle built by Mitsubishi Motors for in-wheel drive system development and testing purposes was the Colt EV, announced in May 2005. Derived from the standard production Colt compact model, Colt EV is driven by in-wheel motors mounted on the rear wheels and powered by a lithium-ion battery system. With the Lancer Evolution MIEV high-performance 4WD in-wheel motor test vehicle, the Company has taken the next step forward. After removing the engine, fuel tank, transmission, differential, drive shaft and other 4WD components from the production Lancer Evolution IX sports sedan, newly developed outer-rotor in-wheel motors were mounted on all four wheels. Fitted under the floor between the front and rear wheels in the space vacated by the 4WD components, a lithium-ion battery system powers the motors. The design makes raising power output and torque easier and makes the speed reducer unnecessary, which reduces energy losses and restrains the increase of unsprung weight. Elimination of the speed reducer makes the motor easier to fit into wheel house. 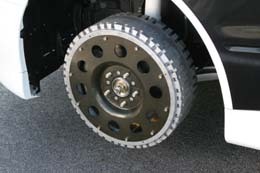 The doughnut construction creates space in center of the motor for the brake assembly and other components. 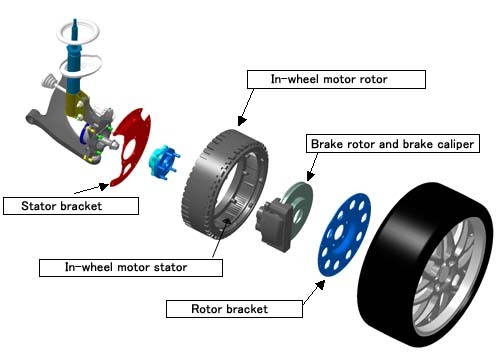 The outer-rotor construction also allows the motor to be mounted on the front wheels, something not possible until now because of the presence of steering system components. This evolutionary feature has opened the door to the realization of 4WD in-wheel motor vehicles and widened the potential for EV's. 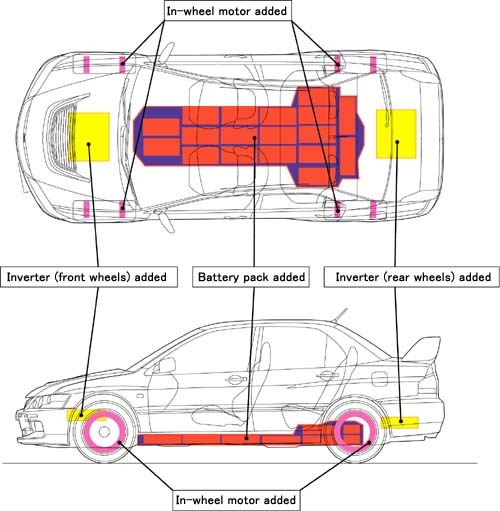 One of the Company's major objectives in developing Lancer Evolution MIEV is to evaluate the outer-rotor type in-wheel motor construction, key to 4WD in-wheel motor vehicles, under an extensive range of driving conditions. To this end, Mitsubishi Motors has acquired vehicle type certification for Lancer Evolution MIEV to allow evaluation not only in the proving ground but also under normal driving conditions on public roads. These evaluations are designed to verify the reliability and durability of the outer-rotor in-wheel motor when subject to road surface inputs, to water inundation, and to exposure to sand and dirt - the major challenges this type of motor must overcome. The test program will also allow the Company to carry out research and development aimed at raising performance and at reducing weight and size. Leveraging its trademark all-wheel control technology and know-how, Mitsubishi Motors is also considering developing a system that controls drive torque and braking force independently at each wheel and is eying its use in Lancer Evolution MIEV. The Company will aim for the realization of high-performance electric, hybrid and fuel cell vehicles that deliver not only superior environmental performance but also output performance and maneuverability equal to or better than gasoline-fueled vehicles. Maker Toyo Denki Seizo K.K. Open to electric vehicles licensed for use on public roads, the Shikoku EV Rally has been staged by scientists at universities in Shikoku every year since 1998 with the purpose of promoting the use of EV's. This year marks the eighth time the Rally has been held. Mitsubishi Motors has entered models such as the FTO-EV and Eclipse EV test cars in the Rally from the first Rally through 2003. The Company will be entering the recently completed Lancer Evolution MIEV in this year's Rally to test its driving and battery charging performance under normal driving conditions on public roads and to promote the MIEV next-generation EV concept among the general public. Route details: 12 stages over public road with Tokushima College of Technology as the base point. Performance testing and measurement over special stages.